Poor supply management of blood products poses a critical challenge for healthcare supply chains in support of humanitarian operations. A mismatch between blood product supply and blood product demand can have catastrophic consequences that can lead to loss of life, especially when humanitarian efforts are deployed as a result of a disaster. 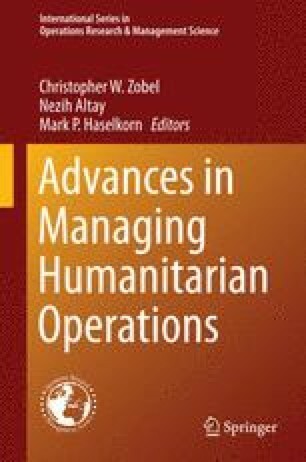 This study is motivated by the Doctors Without Borders/Médecins Sans Frontières (MSF) (http://www.doctorswithoutborders.org/news-stories/special-report/syria-two-years-failure-international-aid) report. The MSF report describes the complexity, enormity, and critical importance of meeting the medical care and blood product needs for civilians under intense bombing in Syria. This chapter adapts a perishable inventory–routing problem with a single blood collection center and multiple hospitals with uncertain demand. To solve the problem, we use a newsvendor model in conjunction with a generalized traveling salesman (TSP) model combination to determine optimum quantities of blood and to determine the best possible route to meet the blood demand. We develop a two-stage linear programming representation of the underlying stochastic program. Such a representation is easy to scale up to real –world scenarios of providing humanitarian aid through healthcare supply chains. It also allows us to consider additional complexities such as truncated and correlated demands which can lead to some interesting insights in managing blood products inventory.